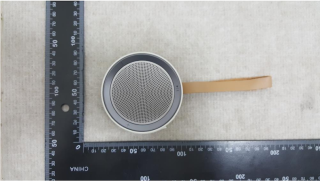 Samsung Scoop circular speaker revealed by FCC website | What Hi-Fi? Among the documents revealed is a user manual for the Samsung Scoop, a new portable Bluetooth speaker that straps to your wrist. Documents on the website of the Federal Communications Commission (FCC), the US regulatory body for the technology and communications industry, have revealed that Samsung has completed the design of a new portable speaker, the Samsung Scoop. The files, discovered by Australian technology website Ausdroid, show images of both the inside and outside of the Scoop, as well as a basic user manual for the device. The speaker has a diameter of just under 10cm, and comes with a leather-looking strap to go around your wrist. Around the edges of the speaker's body there are buttons for pairing the Scoop to your Bluetooth-enabled device, playing music and controlling the volume, as well as a microphone. There is also a 3.5mm input jack, although it is unclear whether that is for audio input or for headphones. The documents don't appear to mention the size of the battery, though they do show a micro USB charging port. There is no mention of a release date, but with a user manual among the documents on the FCC site, it is possible we could see the Scoop being demonstrated at IFA 2016 in Berlin. We'll bring you more details as we get them.